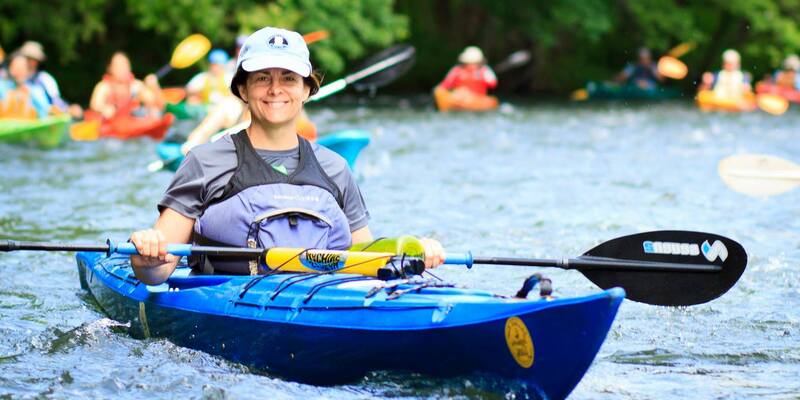 Experience 112 miles of Pennsylvania paddling! Bad Adventures guides the Schuylkill River Sojourn, a 112-mile, 7-day canoe and kayak trip in Pennsylvania for our partners at the Schuylkill River Greenways. We begin the trip in headwaters from the borough of Schuylkill Haven, where the river is only a couple boat lengths across. We go on to finish a week later on Boathouse Row, with the Philadelphia skyline rising high before us. Along the way, we paddle through Appalachian forest, small towns, bustling industrial areas, fun rapids, and even a restored section of the Schuylkill Canal. You can choose to paddle as little as a day or continue for the whole week. Guides, vehicle driver shuttles, river-side camping, hot meals, and showers are all included. A well-curated selection of entertaining and educational programs are presented daily at lunch and in the evenings. The trip attracts an amazing group of participants. Many of the days routinely sell out quickly. I’ve had the privilege of guiding on the Sojourn each of the past 14 years. It’s become an annual highlight for our whole team. This is one of the best ways to spend the first week of June. Learn more and book your spot with our partners at the Schuylkill River Greenways. See you on the river! Subscribe to emails and learn about new trips and courses first. No spam. Unsubscribe anytime. © 2013–2019 The Bad Adventure Company LLC. All rights reserved.